Welcome to the Fit Friday Meal of the week. This quick and easy recipe is simply delicious! 1. In a food processor, add the coconut milk, broth and lemon juice. Add bananas, curry powder and garlic. Salt and pepper, if desired. Mix well. 2. In a large saucepan, heat oil over medium heat. Brown the chicken cubes for about 2 to 3 minutes. 3. 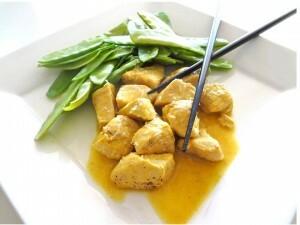 Pour in the coconut-curry sauce and let simmer, uncovered, 15 to 20 minutes, until the chicken is cooked. Just before serving, sprinkle with grated coconut. I had been paying $30.00 Australian a month to recieve your metabolic cookbook. I have NEVER received the cookbook ever… Couldn’t download it… But have been receiving your emails ever since. I would like to know why I could never download it and if I still could possibly… I paid for and expected to receiver it hard copy I think instead of downloading. Do you send hard copies or can you please allow me to access the metabolic cookbook I was trying to buy. Over a years time or 19 months i thin it was,I would have paid you well over $400.. Why is this???? Metabolic Cooking is a downloadable e-book. No physical products will be shipped. After you order, you will get INSTANT ACCESS to download the e-book, the components and all the exclusive bonuses onto your computer. The e-book format is adobe acrobat PDF, which can be viewed on Mac or PC. It also looks like you subscribed to our cookbook of the month club ($14.95/month) which is accessible in our access center. You should have been provided all the logins after your purchase. If you didn’t please email Martina at support@metaboliccooking.com , she will hook you up. I just wondered what the nutri profile is of this dish? It sounds amazing but I’m hoping it will fit in with my Metabolic Cooking requirements as I am currently following the plan.